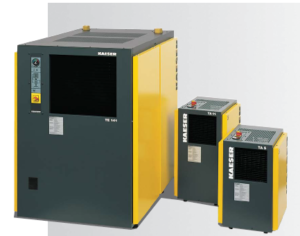 Kaeser’s line of industrial air compressors are designed for reliability, maximum efficiency, and easy maintenance. Kaeser’s rotary screw industrial air compressors are available from 3 to 700 hp with capacities from 9 to 3044 cfm, and pressures up to 217 psig. All units are fully packaged, ready for operation. 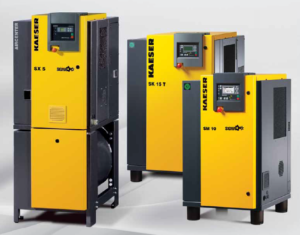 Kaeser’s rotary screw industrial air compressors are available from 3 to 700 hp with capacities from 9 to 3044 cfm, and pressures up to 217 psig. All units are fully packaged, ready for operation. With sound levels as low as 61 dB(A), our compressors offer the best in quiet operation, energy efficiency, and reliability. In every machine Kaeser builds you’ll find many features to enhance reliability and simplify maintenance, from the heavy gauge steel frame with double vibration isolation to the quick fluid change feature. Our airends are built to stand up to many years of tough service. TEFC motors are standard and we use hard pipe instead of lower cost tubing for internal fluid lines. Our air compressors have a well-planned cabinet design and component layout to reduce noise and footprint and provide easier access during preventive maintenance. The list goes on and on. Our customers expect excellence and we make it happen. Every cubic foot of ambient air contains millions of particles of dirt, dust, moisture vapor, and hydrocarbons. Inlet filters protect your compressors from the larger bits, but the majority of these contaminants pass through the compressor and affect compressed air quality downstream. Further, the process of compressing air introduces compressor fluid and other contaminants into the air stream. To protect your expensive tools and production machinery and increase product quality, you need to remove condensed liquids, solid particles, hydrocarbon aerosols, and perhaps even hydrocarbon vapors. 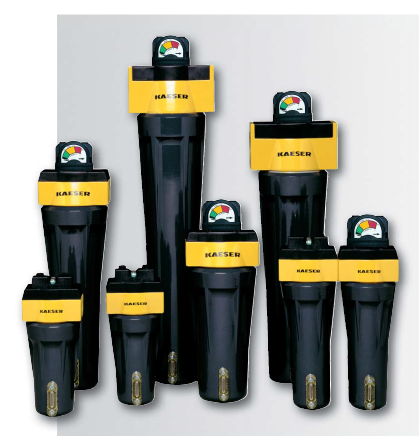 Kaeser offers a complete line of filters —including moisture separators, particulate filters, coalescing oil removal filters and vapor adsorbers— to deliver superior air quality in accordance with ISO 8573.1 for whatever your application demands, from general shop air to clean room quality for pharmaceutical and sensitive electronics manufacturing environments. Kaeser’s SmartPipeTM is a modular aluminum pipe for compressed air installations, offering both lower installation costs and lower long-term operating costs. From small shops to large industrial systems, SmartPipe is great for all facilities and is available in sizes up to 8″ pipe diameter.